I thought I'd just make a list and post photos of the confirmed cast for the movie. It might prove useful for referencing in the future. ...I'm sorry. I just... can't respect this guy when his hair is like that. What a fruitcake. You know her from: ...Nothing? All her roles have been small. You know her from: If you've been watching "Ned's Declassified School Survival Guide" (TV - what in the world is this show about?!) you'll know her, otherwise not. 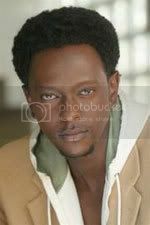 You know him from: Nothing! He didn't even plan on auditioning for any role, but when he took his younger brother for auditions, he was convinced to try out, and voila! a star was born. Hair: HE'S WEARING A WIG!!!! And it's not going to be in a ponytail because that would be too similar to James, apparently. 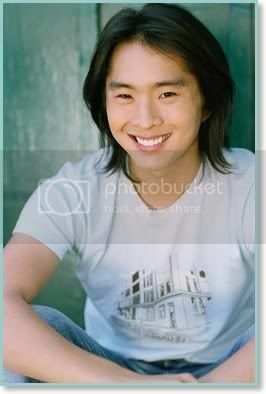 You know him from: Cheaper By The Dozen 2, The Adventures of Sharkboy and Lavagirl (i only saw the ads for this movie, but eh), various small roles on TV shows. You know her from: 24 (TV), guest roles on TV shows, and Thirteen (funny, Nikki Reed and Catherine Hardwicke co-wrote this movie, with the latter directing it). And now some for the Cullen family together! Just so they're all in one place. ...And so I can laugh. Wow this is great! Thanks Ammy! and yayness to the fact that it comes out fives days before my birthday!! 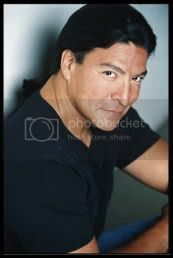 Gil Birmingham is also in one of the best episodes of the first seasons of Bones (the Man in the Bear)...and when I was watching it I had actually thought about him being Billy. which is weird. I like Sam...but he looks too nice. thanks for compiling the list!!!! its so much easier now. It was so hard to find a photo of Solomon Trimble! I found this tiny picture of him showing about half his face, and I was prepared to use that, but when I checked on the Lexicon, he'd had an interview with them and there was a photo of him. Having trouble applying these vampires into the "supernatural gods/goddesses" they are in the book. They aren't even that attractive! Carlisle looks so weird (too young and not attractive -- no way nearly enough for the "god" he is portrayed as in the book) and Esme way too ordinary, they should have gotten Salma Hayek or Kate Beckinsale, but then, Summit would find it hard to get actresses like that anyway. Look at the second Cullen family photo -- Esme and Rosalie look like men in dresses for some reason. 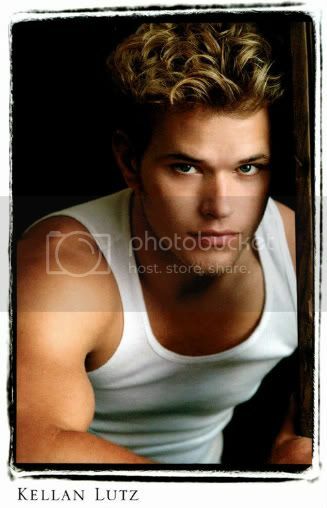 Kellan Lutz is the only good one, but even that picture of him makes him look weird. Oh wait, Nikki Reed is attractive too, but she doesn't suit the blonde hair and I always picture Rosalie as voluptuous rather than voliminuous. Ashley Greene is pretty too. Looks like Miranda Kerr. 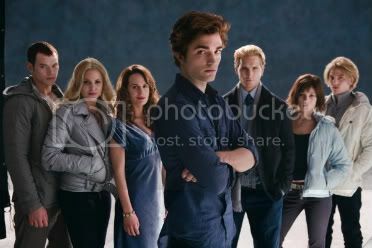 I like the rest of the cast, apart from the Cullen family. I find their perfection annoying, but the movie will be throughly stuffed-up if the guy who plays Mike out-shines Jasper and Edward (which he probably will) and Angela and Bella looks better than Esme. 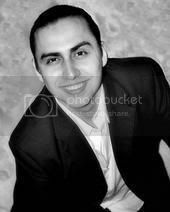 They all look so pretentious in those photoshoots. And Rosalie is meant to have prettier clothes. And Jasper isn't meant to look.... like that. Oh well. I'll live, I guess. Haha. Esme was an unexpected choice, but I think she has a very motherly feel to her. And her voice is so unusual! In a good way. It's very recognisable and I think it might be because she mumbles a little. But she definitely has an alto voice and it's a refreshing change. The reason I like to laugh at the Cullen family photos is because Esme and Rosalie look strangely like men in the second photo! I know it's mean, but I cannot help bursting into a fit of laughter at the sight of the photos. It's ridiculous. 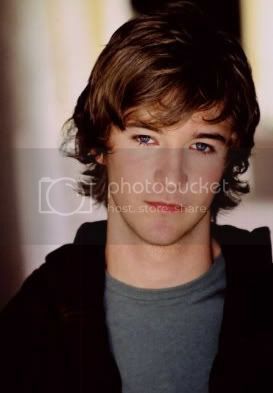 And Michael Welch is adorable! Apparently he's very nice to fans in real life as well. Awww, Michael so is. When I see his picture I'm all "naaaaawwwwwww!!!" 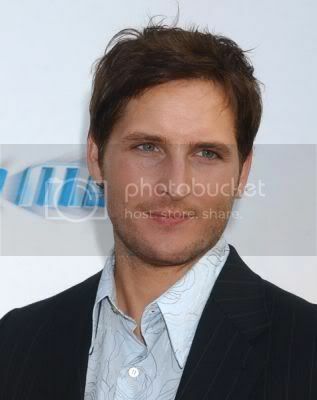 Oh, you are so right about Carlisle. Its like there is nothing there. I know! That’s exactly what I said, they look so masculine in that picture. And why is Rosalie wearing a sport jumper/jacket thing? 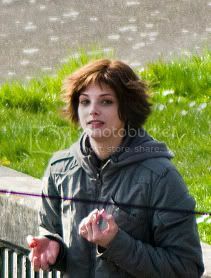 That’s not very like her, I always thought we would see her in fashionable clothes and the Cullens look pretty ordinary in that picture. Not the “designer designer” clothing Bella gaped on and on about in the book. @ Izzy - I know! I expect we'll see more of it in the actual film, but these are official promo shots, so they should have added in that small detail, shouldn't they? All they needed to do was dress them up in something glitzy and take a few shots. As opposed to tracksuit-type clothes. And Steph, they haven't announced a Jacob yet. There's rumours flying around that it's Taylor Lautner, though. Not too sure what to make of those. Taylor Lautner? Ew. No, I hate pretentious child-stars, and he's a boring actor (he was a kid in Cheaper by the Dozen, but had an unrealistic public speaking voice), his smile is annoying. Get someone who doesn't have a mega-watt smile which they need to atrociously glimmer the camera with! Okay, that sounded mean, but he would be a bad Jacob! 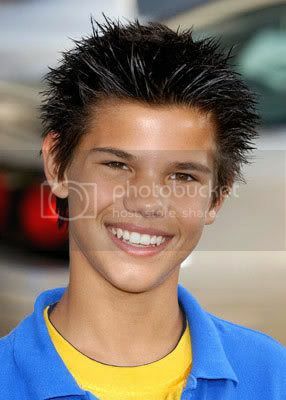 Taylor Lautner IS Jacob. hahahahah Oh man. Oh MAN. 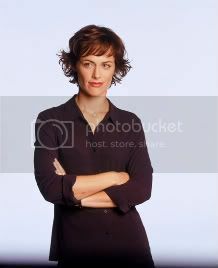 Sarah Clarke is Renee. I've updated the cast list, and there's a link to an interview with Taylor Lautner. Here are more fun links for Twilight! There's videos on most. 1. 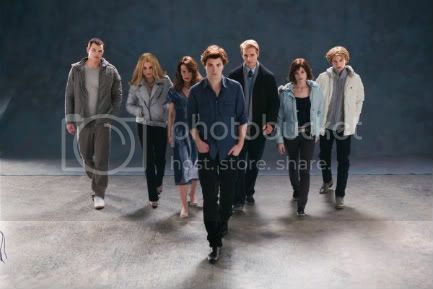 Behind the Scenes of Twilight - There's scenes of the Bella meeting James in the dance studio! And there's a big fight in the movie at that point. And the scene where Edward saves Bella from the car! It's pretty funny watching them practise this part. Robert almost LAUGHS at this. "I save Bella with my... vampire powers. *tries to resist urge to laugh*" Kristen talks. This video is AWESOME. 2. Stephenie's Cameo - Three videos. You'll also see Nikki Reed and Kellan Lutz. So apparently Stephenie appears as a diner in a restaurant in Forks, being delivered a vegetarian plate. hahaha. It's not the Port Angeles restaurant, keep in mind. It's a scene with Charlie and Bella. Also, is anyone interested in reading all cast interviews to date about the movie? It's stupid to cast him I think...they should've casted someone older that they could make LOOK young, because then they could use him in the rest of the movies. Unless there's a huge gap, and Taylor grows and muscles up a lot, he's only a one-movie-Jacob. I think I can live with that, although they are going to look REALLY awkward together. He just looks TOO young. It's creepy and feels slightly pedophilic. I just really like the attitude that everyone involved with the project seems to have. They aren't taking themselves too seriously by trying to make some uber dark and moody vampire movie - they are focusing on the realest possible way to make this happen. Also, they really seem to be making a movie FOR THE FANS. How often does that happen? I think I'm just glad to see that this is a movie about the story, not a movie for movies sake. Even if things are changed, which for a movie they have to be, I feel like it's going to FEEL like Twilight. I love that everyone's so passionate about this! They have Stephenie on hand (some days at least) to help them out and carry out HER vision. And she is so devoted to making the movie work. She let Robert read all of Midnight Sun!!! Well, all that she's completed, anyway. But those first 12 chapters are important for acting out Edward's character. Taylor Lautner really does look too young. It's disappointing, because I wanted the same Jacob for all the movies. They'll probably end up using him again in the second movie because, well, he IS Jacob now. But they're going to begin shooting in December this year or very early next year! I think the CEO of Summit said that. Still... he's going to have to grow in order to fit the werewolf physical attributes in the second movie. I keep watching that first video because it really makes me excited for the actual movie. Of course, I was excited before, but this is even better. I really love that Robert almost laughs at the "vampire powers" Edward has. teehee. I'm liking the choice of Robert for Edward. How cute is Kellan Lutz? haha, He and Nikki Reed look great together. 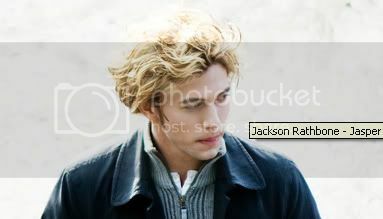 I'm not going to comment on Jackson Rathbone. Ever. Okay, maybe to make fun of his hair. The cast of Twilight don't know the full extent of what they've gotten themselves into! It's going to be HUGE. 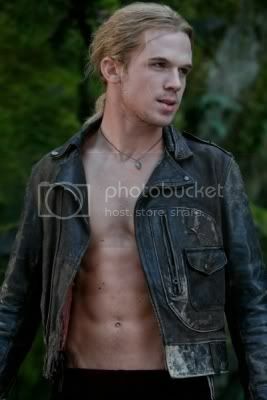 I love Kellan Lutz! 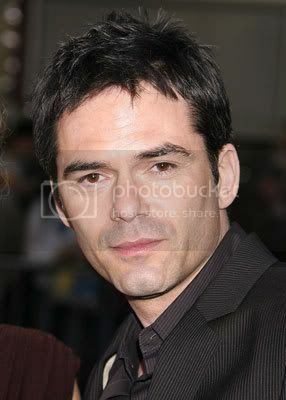 which is a carry over from Stick It and his much-hated appearance on Heroes. I think he can embody that rambunctiousness that Emmett always seems to have. I can so clearly picture him saying some of the lines when he's making fun of Bella for being clumsy and stuff. I think it's awesome Robert read Midnight Sun. It's a direct line into Edward's mind. Unless Taylor Lautner has done a lot of growing recently that we just haven't seen...he's not going to last another movie. They probably had trouble finding a Jacob though...maybe it will be easier if they can find someone older. How I wish Steven Strait was the right ethnicity. He's a little taller, but not really the right build. wow that is so weird looking...I mean, I see it more than I did before, but still. He's a pretty ripped kid (because he did martial arts and all that) and I just can't see him getting bulky enough to be a wolf. it took me forever to figure out who he reminded me of, but he seriously looks like my boyfriends brother Brian. Only with black hair. which is now REALLY weird to me. i will never ever be able to crush on movie Jacob. haha, i was thinking the same thing, but for different reasons. i'd feel REALLY weird crushing on someone who looks so young. it's just not in my system to do that. I think that Taylor Lautner will make a good Jacob. Watching that interview and just finish re-reading New Moon and getting all fangirl-ish over Jacob I got really excited. He will play a good Jacob for Twilight, remember that he is just supposed to be a cute kid from the reserve. I don't know about the next books though Jacob grows alot (i believe over 6'6) so that's going to be hard to imitate but meh. I still get all excited. Words aren't enough to describe how bad that long hair looks on him (personal opinion). I don't like him as Jacob, his acting is so boring! But I understand how hard it must be to cast. True that. They sent out a casting call for ANY Native American boy of ages 14-??? who might want to try out. Apparently, you didn't need any acting experience at all. But I guess Taylor Lautner it is. The wig looks weird on him. I mean, if you just look at him with the wig, you could get used to it. But try imagining him as Jacob when he's got the wig on. It's not so flash then. The most Jacob-y thing about him is that he's got a HUGE bright smile. I have to accept him as Twilight Jacob and even early New Moon Jacob on that alone. I think it's going to be impossible to have someone to fit Jacob once he gets taller and changes. There's no way a person like that is even possible - which I think was part of the point. He's growing on me as Jacob, but I'm really reserving judgment until I see him. I agree with Ash, his big smile is great! His voice isn't as deep as I imagined Jacob's to be but still when I watched that interview i was convinced. lol. Maybe its because I didn't have a full image of what Jacob looked like. 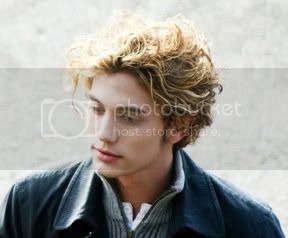 Even though now that I am halfway through Eclipse I still have my "image" of Jake in my head. Is there even going to be a second movie? It'll be more work, and the directors/producers will probably get put-off it when the fangirls unleash their wrath on the entire production once it's out in cinemas. Putting that aside, I still don't like him. 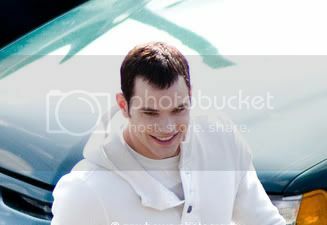 Whenever he's acting, he uses that smile WAY too much (like Jodi Gordon, but she's sort of stopped that). 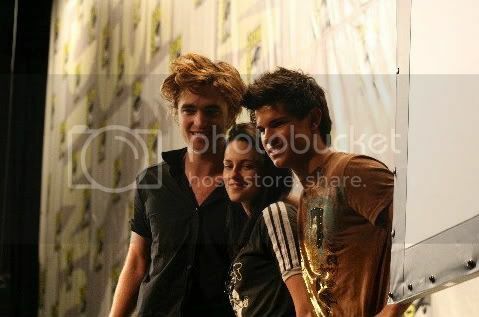 It gets on my nerves when he blinds the camera with it, and Kristen Stewart is a pretty tall girl herself (right? ), she has the whole sporty/athletic/fit look to her and she's going to look way too old for him if he even acts in the second movie. BTW, it's cool that Meyer let whoever's acting Edward to read Midnight Sun. Not many authors do that. I don't think I'll be able to like Taylor as Jacob until I see him in the role. I can accept him, sure, but I won't be excited over his portrayal of Jake. It's really great that Stephenie is letting him read Midnight Sun, though. 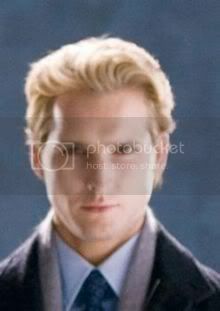 When I heard I was thrilled, because this will help add an entirely new layer of sophistication to Edward's character. Robert will be able to act knowing what Edward is thinking at the time. 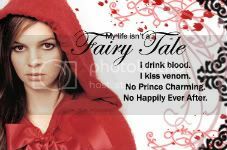 The Alice has the same last name as Rex [[from Midnighters]] Hehe. And Annabelle from Just Listen. I don't know why but when I stumbled upon this it made me smile. 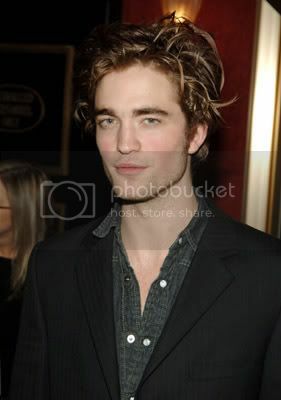 I'm pretty sure there's a publicist somewhere out there who tells him to let his hair be crazy messy, because somehow that's "Edward"
if you look at his imdb profile he had crazy messy hair for harry potter pictures as well. maybe it's just "his thing"
I hope his hair doesn't look like that when he's being Edward. That would be really weird.